Sean Michael’s new book “Stygian” is a telling, raw and poetic journey into the author’s life. 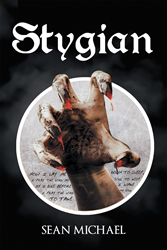 Recent release “Stygian” from Page Publishing author Sean Michael is both riveting and provocative; this compilation of poems will open the reader’s eyes to a world of abuse, poverty, crime and drugs. Sean Michael, a current prison inmate, artist, poet, devoted writer and author, has completed his new book “Stygian”: a passionately crafted work that delves into the ideas of personal identity and strength. Published by New York City-based Page Publishing, Sean Michael’s eye-opening work is the perfect read for any poetry enthusiast. "Poverty, drugs, child abuse... The streets' incarceration... Questions of life and contemplations of death, Stygian is the darker side of poetry collected from teen years into young adulthood and composed in homeless camps, churches and a jail cell. The emotion is raw, the poetry is real,” said author Sean Michael. Readers who wish to experience this mesmerizing work can purchase “Stygian” at bookstores everywhere, or online at the Apple iTunes store, Amazon, Google Play or Barnes and Noble.